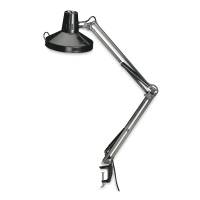 The Alvin Swing-Arm Combo Lamp provides incandescent and fluorescent light in one convenient unit. Independent switches let you use one or both, depending on the project. This lamp is equipped with a 10" (25 cm) diameter metal shade and stay-cool chrome handle. 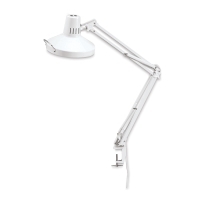 It also has a balanced arm with a 45" (114 cm) reach, letting you easily angle the perfect light positioning. One energy-saving T5 28W circular fluorescent bulb is included.